“Loving You doesn’t mean owning You. 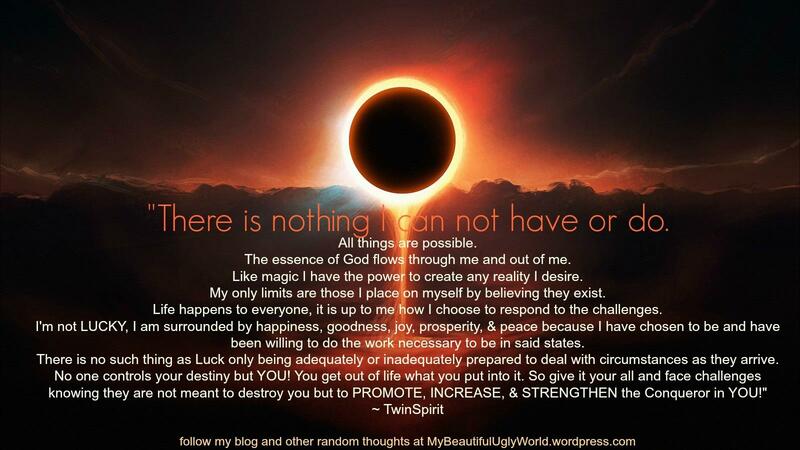 It does not give me exclusive rights to your heart, mind, body, or soul. It however allows me the opportunity to share those beautiful parts of you in whatever way you wish to share them with me. It allows me to view the world through your eyes, to feel, to see, to hear things in a way that only you can and to savor that expression. I do not want to hoard you or hide you away from the world. I want my love to be Freeing and for it to wrap you in a blanket of comfort so warm and secure that it encourages and inspires you to LIVE and be the most Authentic Version of yourself that you can. Random Musings: Find Your “HOW” & Execute! “There is, perhaps, nothing more common to the Human Experience than conflict. It often stems from varied perspectives on a situation; differing belief systems and values resulting from a persons accumulated life experiences and conditioning; and differing objectives and interests. There is one thing in this life that I know for sure. It is that I will never fully understand everyone’s perspectives on this journey but I do respect their right to have them. I may not live, love, emote, see, express, feel, grieve, respond, look, or think as you do but that doesn’t make me any more or less human than you. The truth is that we were all born into our histories. We did not earn the accolades that are associated nor the shames. We have no true recollection of where the strife began nor do we fully know where to point the finger or know each individual who is to blame because we were not there. We can repeat the stories shaped and retold over the decades. Handed down generation to generation but we can never be for certain of the total and complete truth. All we know for sure is the current pain and suffering being caused by deeply ingrained hurts and fears birthed from belief systems with roots so deeply embedded that they have cut off our ability to see that in all of our differences, that this is what makes us beautiful as a human race. This is the point at which we stand. This is where the “Real Power” lies….We can choose to spend the remainder of our existence on this planet blaming and destroying one another for all the ills that plague us and fighting ghost of the past or we can simply chose to do something different. Singularly or Collectively. Conflict arises when one or more person views the current system as NOT working. At least one party or group is so sufficiently dissatisfied with the status quo that they are willing to own the conflict and speak up with the hope of being able to influence the situation to arrive at an improved condition. Conflict may be viewed as a process we must put ourselves through to achieve a “New Conditions” and “Self Definition. Through conflict we have opportunities to be creatively self-defining. If nothing else, conflict allows us to do things differently in the future. Through the resolution of conflict, we can, if we choose, evolve and redefine ourselves, our relationships, our community, our society and our world. It is no accident that we most often find ourselves in conflict with those with whom we spend the most time. While uncomfortable and often painful, there is a great benefit, in terms of the quality of our lives, in being able to constructively resolve conflict with those around us. The biggest challenge is always the “HOW”. Now is the time to formulate and execute the HOW. All of our how’s may be different but they are all needed. Together they are more Impactful. Find your “HOW” and execute. Don’t waste energy or time dissecting someone else’s HOW, that only creates more division. FOCUS on Your “HOW” and Execute!! I choose to execute my HOW’s with LOVE and Razor sharp precision…. 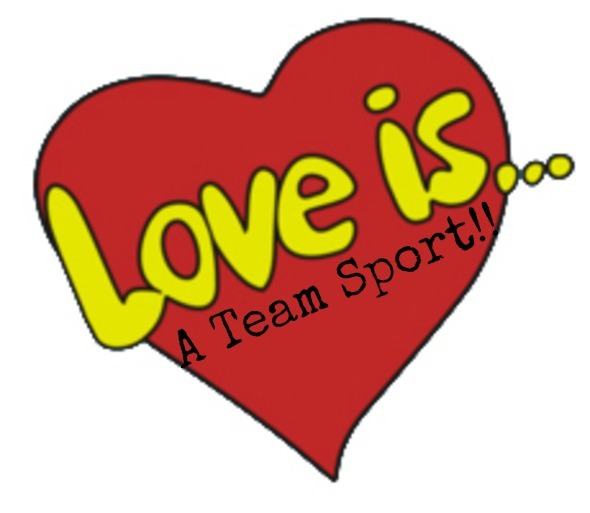 “Love is a Team Sport. Players on successful teams work together with a unified sense of mission – “together” working towards a common goal. They strategize together, train together, trust one another, & support one another. They know one another’s strengths and weak spots and they use this knowledge to always cover one another during lifes tough games. They communicate their next move and together hit basket after basket. They run their plays over and over, which makes them strong and able to handle any situation that might occur. Even when they are tired and things get difficult they stay in the game until the buzzer sounds. When one play doesn’t work they simply execute another. They don’t give up, they just play harder. On & off the court, they encourage and push each other to do and be their best. And no matter what the final win-loss record, these are the teams that shine, grow, stick together, & have the most fun. “I release the fear of not knowing what the future may hold. I expect all things to flow in the direction of my hearts desire. 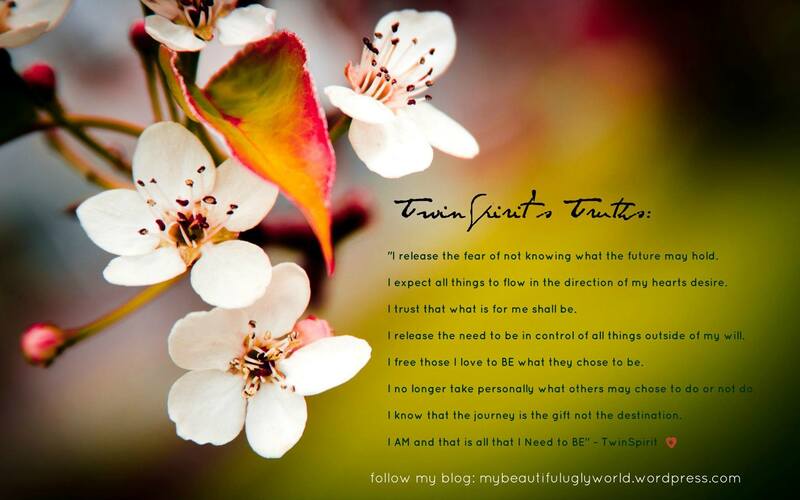 I trust that what is for me shall be. I release the need to be in control of all things outside of my will. I free those I love to BE what they choose to be. I no longer take personally what others may choose to do or not do. I know that the journey is the gift not the destination.